After having numerous problems with my 2006 Mazda 3, I eventually took it into Queen City Auto Body after an accident during the winter. They fixed everything up good as new on only a few short days, during which I was given a courtesy car at no extra charge. I was certainly impressed with the quality of work and vowed to come back for any future business. I then found myself back again not even a half a year later, mostly due to problems on the same parts of the car that were fixed earlier, due to my car being a previous total loss. I had been quoted a fairly big chunk of change by Mazda to get the repairs done but I thought I would bring it by QC to see if anything could be done. They most certainly did not have to fix everything up once again at no charge, but they realized that it may have been problems from my previous accident. Not only did they do an extraordinary job on the car, but they did an even better job of helping me deal with the situation in the best possible way someone could have handled it. Do not even think about taking your car elsewhere if you need to get it fixed, this is the only place you will ever need to visit, and once you have, you will see why! Unfortunately I have had to deal many times with QCAB. But I will go nowhere else! Its that simple. I have brought 5 vehicles there of my own, and have brought 3-5 friends cars there too. They never disappoint, they never let you down. If you ask, they will tell, no BS. The work is always done right, done well, and you will be happy when you leave! Recommended highly! 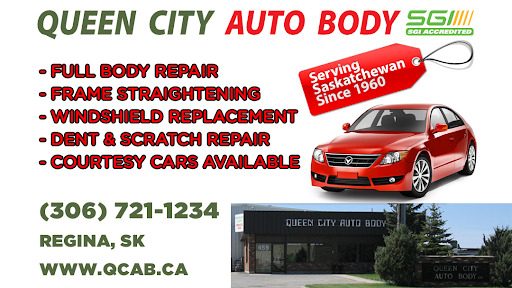 I am very impressed and very happy with Queen City Auto Body Ltd. They take pride in their work and they definitely met my expectations. If you ever need to get your vehicle fixed up, look no further. Also, the owner is very nice and professional. They took very good care of my BMW and I have been recommending this place ever since. QCAB fixed my Adrenaline recently from a rear-end collision, the work was fast & flawless and the truck was delivered back to me spotless. I would recommend QCAB to anyone who cares about the appearance of their vehicle & the quality of the body work being done; and if you appreciate great service, you will get it at QCAB. Great rental/courtesy vehicles on site, completed work on time exactly as scheduled, friendly, flawless job of repairing my vehicle, cleaned the interior and exterior of my vehicle and gave me a little emergency flashlight as a gift. Excellent experience with these professionals. Highly recommend. I had very good experience with their professionalism and workmanship. Its time to go back to them and my expectations are even more. I will post my 2nd experience when I will visit them. Great people, great service, great work, done in timely fashion!